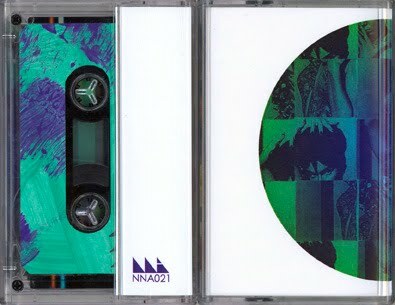 Wow, this is a really lovely tape. For those who aren't in the know, Village of Spaces (currently residing in and around Belfast, ME) is the new moniker for Dan Beckman and Amy Moon's longstanding group that began as Dan's solo project, Uke Of Phillips, morphed into Uke Of Spaces Corners County, which released two LPs on Corleone (check their website: they didn't quite get the baffling syntax right!) and is now onto a more collaborative band sound with members Asa Irons (Feathers), Clare Hubbard (Caethua, Sports, Ancestral Diet), Andy Neubauer (Ancestral Diet, Impractical Cockpit), Big Blood and Michael Hurley (!). 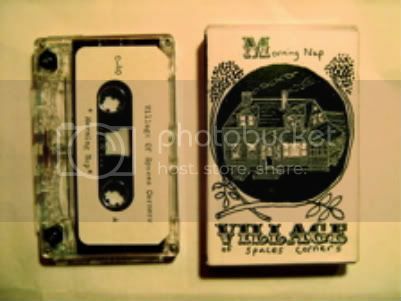 This tape is a collection of "demo" versions of the tunes that appear on the newly released Village of Spaces "Alchemy and Trust" LP (which is a co-release between Turned Word, Corleone and a few other labels). I believe they were both recorded by Nemo from Time-Lag Records. These versions are just as strong as the ones found on the record, and I actually find myself listening to this one more, though I suppose that's because I don't have a record player in my car. It's got an over all rawer sound and there are times when you can hear Dan and Amy's kid crying, but I count both of those things as assets. The songs are vaguely psychedelic (read: echoy with cryptic lyrics), but they also fit nicely into a number of American and English folk traditions. 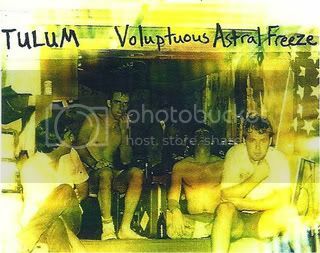 The first cut, "Alchemy & Trust" is so jaw-dropping that I would call it nothing short of a masterpiece. The rest of the album flows nicely from there, with all of the tunes creating wonderful mind-pictures of the beautiful, but sometimes challenging, Maine landscape. I really haven't found a tape that has been this exciting to me since Chris Weisman's outstanding "Fresh Sip" from last year. Dan covers most of the lead vocals here and his vocals have that amazing nasal/otherworldly quality of Ed Askew's work, but his lyrics are a touch more grounded in reality than on that classic ESP folk disk. But now that I mention it, you should also check out the new Ed Askew LP reissue "Imperfection" on Galactic Zoo Disk/Drag City. Those songs are more autobiographical then any of his two previously released albums, & it's so wonderful!! Only 500 copies, so get it while the getting is good. But hey, we are talking about Village of Spaces here. This thing is only an edition of 100 copies, so snap it up before it's gone.